Informed sources in RIMS said the officials of Birsa Munda Central Jail, where he has been lodged, have conveyed to the hospital to keep Lalu Prasad there till his shifting to AIIMS in Delhi. 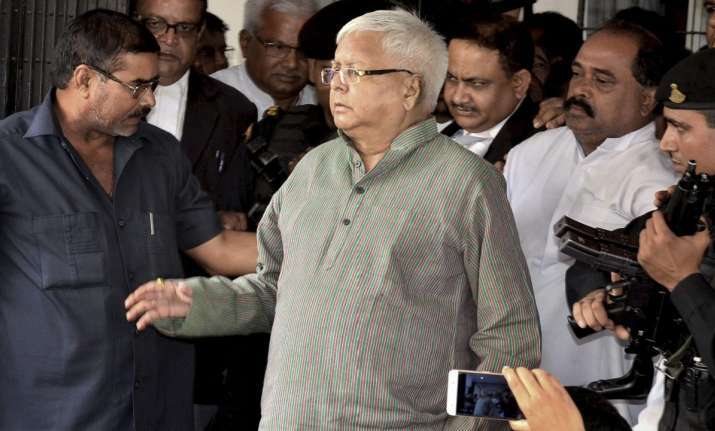 Former Bihar Chief Minister and Rashtriya Janata Dal (RJD) chief Lalu Prasad, who is behind bars in the fodder scam cases, may be shifted to AIIMS in the national capital for medical treatment, said a doctor on Monday. "There is slight swelling on Lalu Yadav's face. He is suffering from multiple health-related issues," said Rajendra Institute of Medical Science (RIMS) Director R.K. Srivastav in a medical bulletin, adding: "He may be shifted to AIIMS for further treatment." Lalu Prasad was shifted to RIMS on March 17 after he complained of chest pain and discomfort. He was convicted in the fourth fodder scam case by a CBI court on March 19 and was subsequently awarded 14 years in jail and a fine of Rs 60 lakh. RIMS formed a medical board last week to assess his health condition. The medical board recommended that he be shifted to a higher medical centre as he has multiple health-related issues which need better care and monitoring. The process of shifting may take sometime, according to sources in the Jharkhand government. The jail administration will have to seek the permission of the court to shift Lalu Prasad from RIMS to AIIMS. Lalu Prasad was convicted in the first fodder scam case in 2013 and awarded five years in jail. The court charged the RJD chief with fraudulent withdrawal of Rs 47 lakh from the treasuries in Banka and Bhagalpur districts. Later, he had got bail. He has been in the Ranchi jail since December 23 last year when he was convicted by a special CBI court in fraudulent withdrawal from the Deoghar treasury and was subsequently awarded three-and-a-half years' of imprisonment on January 6 this year. On January 24, he was awarded a five-year jail term and imposed a fine in the Chaibasa treasury case, before being awarded 14 years in jail and a fine of Rs 60 lakh in the fourth case for fraudulent withdrawal of Rs 3.5 crore from the Dumka treasury.